First, my girls added a few drops of water to all of the watercolor ovals on their paint palette (see below) so that the colors would be nice & juicy and ready to use. Then I gave my girls both wide, flat brushes and had them brush the whole page with water. Then they started adding paint and letting the colors blend together, making sure they painted right up to the tape edges. We also added table salt to the wettest, most colorful areas of paint. 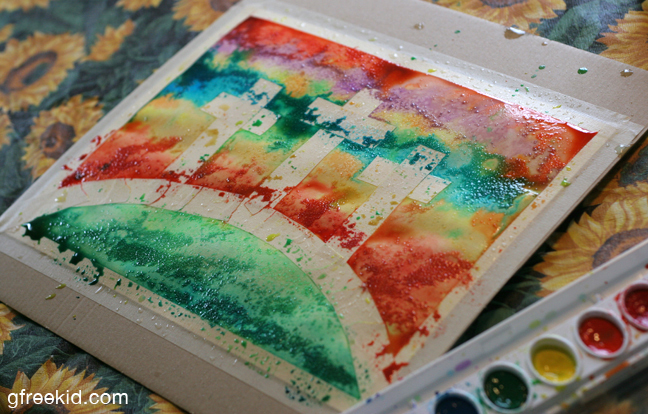 That makes for some fabulous effects when it dries! Let your kids experiment with this…mine love to! Depending on what kind of paper you use to paint on (the thicker quality, the better), you may or may not be able to just leave it “as is” once you unpeel the tape. My original intent was that they would turn out like (A) below. Unfortunately some of our paper came up in pieces when we took the tape off. To cover this up, we made hand-torn paper strips that were the same width as our masking tape marks. I am actually glad this happened because I like the extra texture (B) the paper strips added! 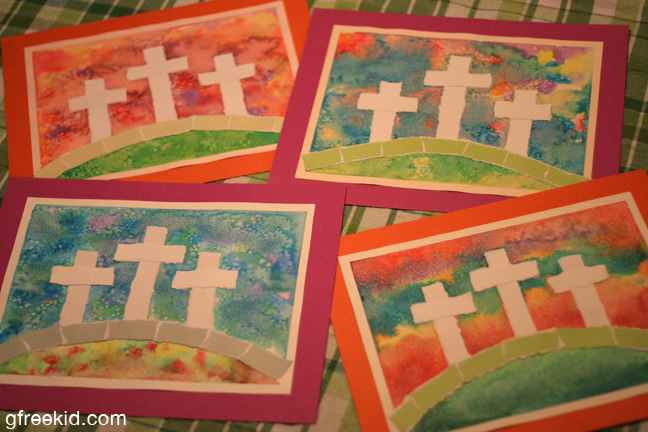 Below are how their paintings turned out after all of the paper strips were glued on. 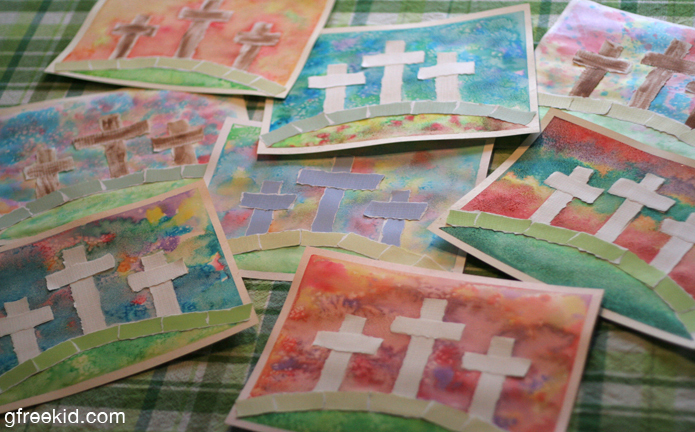 The brown crosses were made by dry-brushing some paint onto the strips before they were glued on. I think the white paper stands out the best on the sky backgrounds, though. 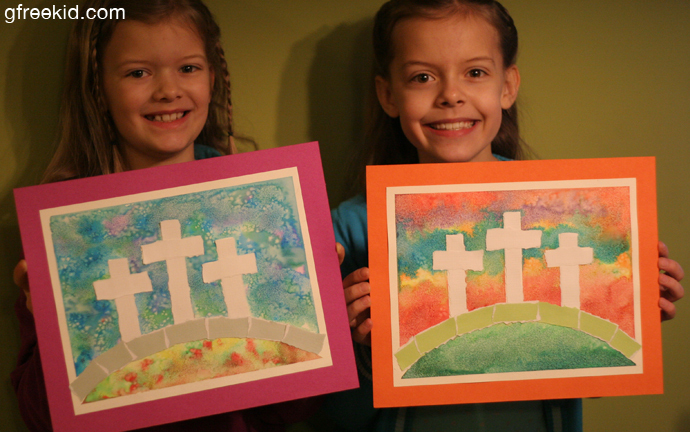 Lastly, we glued the paintings onto some bright construction paper which gives it a more “finished” look… My girls kept their favorite one (hey, our house needs decorations, too!) and the others were given away as Easter gifts to family. I hope you will find the time to make something similar with your child. Here is a link I just found if you would like to further explore meaningful quotes and Bible verses about Easter. 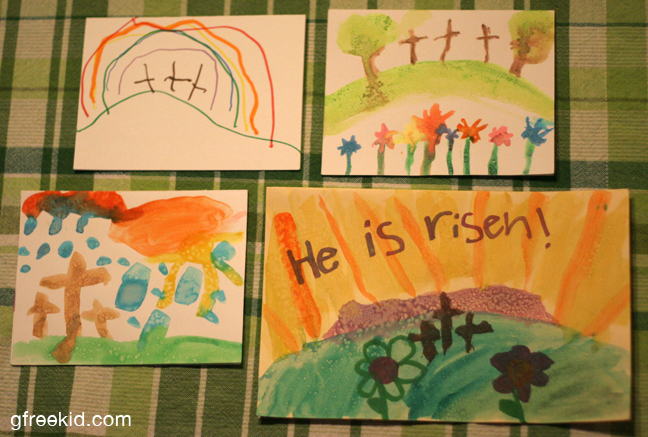 This entry was posted in Activities for g-free kids, arts & crafts, fun for kids, learning and tagged art, craft, cross, Easter, kids, painting, resurrection by kachalmers2. Bookmark the permalink.